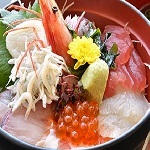 Kaisendon is a Japanese traditional donburi dish which consists a bowl of rice tooped with raw seafood called Sashimi. Kaisendon's "kaisen" means fresh seafood, "don" means a donburi which is a rice bowl. Kaisendon which have vinegared rice is also called Sushidon in some region. Especially, Kaisendon of Hokkaido prefecture is very popular because it is more delicious than it of other area. It has become a synonym for delicious dish of Hokkaido. In Hokkaido, snow crab called Zuwai-gani is a seasonal seafood of the spring. Sea urchins is summer's seafood, salmon is autumn's seafood, Yesso scallop is winter's seafood in Hokkaido. In general, Kaisendon consits several seafood, tuna, salmon, sqid, octopus, crab, scallop, salmon roe and more. Most Japanese people put them on top of rice with pouring soy sauce and horseradish called wasabi. Sauce of Kaisendon varies by restaurants, some restaurants do that with special sauce made from soy sauce, mirin, sake, garlic and ginger. The history of Kaisendon is uncertain, but it is said that Kaisendon was introduced to all over Japan from Hokkaido prefecture and Tohoku area. Kaisendon is thought to have been cooked and eaten by Fishermen in Hokkaido and Tohoku at first. The first restaurant serving Kaisendon is also uncertain. 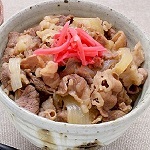 The restaurant named New Hatakane in Akita prefecture and the restaurant named Inoya in Kanazawa city says they are the first restaurant serving Kaisendon. In addition, the difference between Kaisendon and Chirashi-zushi is also uncertain. Chisashi-zushi is one of the sushi dishes consists several raw seafood and rice. It has vinegared rice, and is packed the boxes for food. 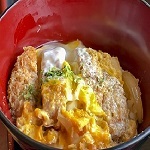 However, there is Kaisendon which has a vinegared rice in west area of Japan. Some sushi restaurants serve Chirashi-zushi in a rice bowl donburi. By the way, there are some Kaisendon which have only one ingredient, Tekkadon, Negitorodon, Unidon, Ikradon and more. Tekkadon and Negitorodon have only tuna, Unidon has only sea urchins, and Ikradon has only salmon roe. They are thought to be one of the Kaisendon. 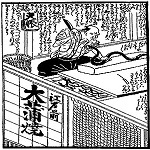 In addition, Tomoedon and Bakudandon are not famous but popular in some region. Tomoedon consits three ingredients, sea urchins, salmon roe and scallop. Bakudandon consists tuna, egg, okra(gumbo) and natto(fermented soybeans). Most Japanese also eat them with soy sauce and horseradish. There are many Japanese restaurants serving Kaisendon in Japan, especially in Hokkaido prefecture. There is also Kaisendon restaurant chain named Donmaru in Japan. It opens their restaurants all over Japan. When you travel Japan, it might to be a good idea to eat Kaisendon. You can experience Japanese culture through it. If you can not eat it in Japan, you can cook it easily with buying soy sauce and horseradish.